Richard and Adam Holywell who were just adored on Britain’s Got Talent have been singed for “the Time of Your Life.” This isn’t the drama series that aired on ITV in 2007, but a brand new documentary about the Holywells rise to fame from their first Britain’s Got Talent Audition up to their album, “At the Movies.” The singers’ story is touching and their launch to fame was very interesting. 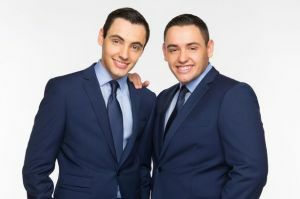 Holywell brothers Richard and Adam will make a return to TV screens this week as they star in their own documentary. The programme, entitled Time Of Your Life, follows the story of the former Britain’s Got Talent finalists from their very first audition right through to the release of their third album, At The Movies, this summer. It will see them venture home to North Wales from Liverpool to visit family and friends, stopping at a few familiar places along the way. Richard, 24, said he has not yet seen the documentary and is looking forward to joining fans across the country in front of the television. He said: “It was like stepping into the past, going back to where we used to go, doing what we used to do and talking about it, it was really interesting. He added: “The documentary is a reminder for us and everyone else how far we have come and how lucky we are. Part of the programme also features the Richard and Adam Groupie Group and its founder Eleanor Tatler Hemmings, of Flint. The Groupie Group, which now has more than 1,100 members, recently held a charity event in aid of Alzheimer’s and Parkinson’s UK as Richard and Adam’s nan suffers from both dementia and Parkinson’s. ITV has a good knack for picking up on new celebrities and documenting their stories in unique ways. Helping the “little guy” has always been a British virtue, and shows like X Factor and Britain’s Got Talent are great vehicles for helping those with unrealized talent get their start. I’m glad ITV concentrates on helping people get ahead.